When Toni Randall arrived in the Rogue Valley seven years ago, she knew it was a needlepoint no-man’s land, but her desire to share what she loves to do is changing that. “Needlepoint is like breathing to me. It is part of life,” she states matter-of-factly. She was seven years young when her mother first taught her how to stitch and it has been a part of her life ever since. At almost 80, this is impressive. Imagine 13 or 18 stitches to the inch per canvas, per project, each year and one can barely conceive how much she has stitched. 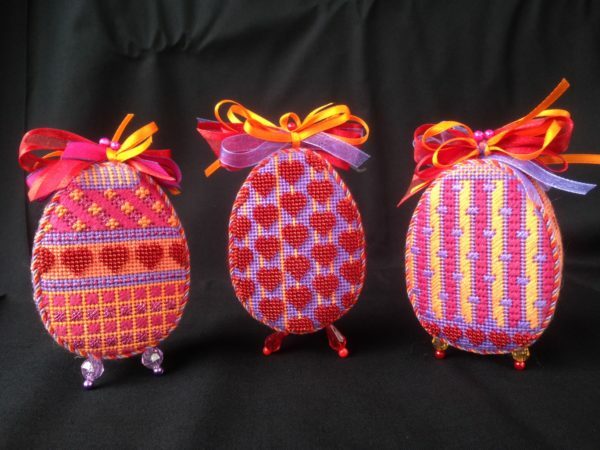 On February 16 and 17 at Sew Creative in Ashland, there is an inaugural event affectionately called, For the Love of Needlepoint,” where attendees can see canvass designs and meet stitchers offering classes and how-to demonstrations. Randall’s canvasses will be available for purchase and guild members from Southern Oregon Stitchers, which is part of Embroiderers Guild of America, will be in attendance. 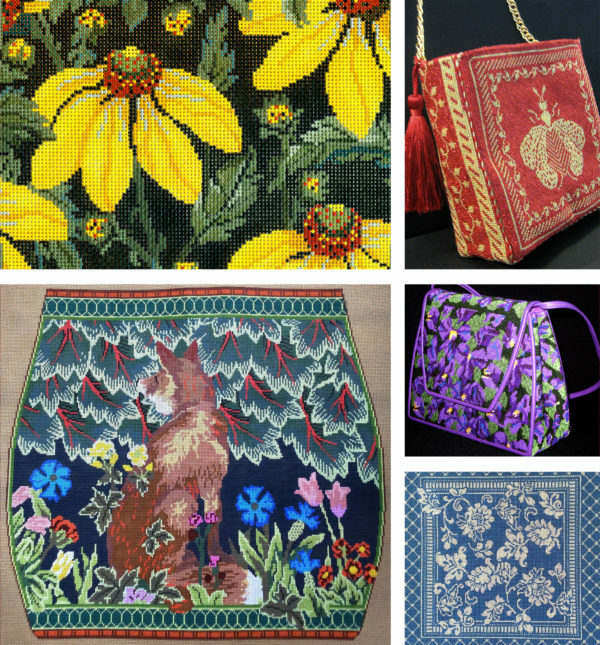 “Needlepoint is an art form that is lovely and lasting,” Randall states proudly. It has been around since around 3,000 BC and was called tent stitching in the 1700s. Randall truly understands the power of needlepoint to stitch the fabric of time. She can look at a piece she made and remember what she was doing, who she was with, and what was going on around her. Without the hours with her mother and grandmother stitching, she may never have heard their stories. Randall tells her own bittersweet story of a gift that she once made for a dear friend, Ginny, who has since passed from breast cancer. Ginny’s son called recently to explain that now his daughter treasures the gifted scissor case because she remembers whenever her grandmother taught her to sew, it was always sitting in her lap. In her 20s, Randall’s story was forever changed by a compliment. While on a quick supply visit to a shop in Florida, the owner asked her where she found the design she was working on. Randall pronounced, “It is my own.” That eventually led to a national distributor picking up her designs around 1999. Now, she has a successful business, Whimsy and Grace, and over two hundred shops carry her unique needlepoint canvasses. “When I design, I paint one thread of one canvas at a time under the magnifying glass. In America, we still hand paint our canvasses.” Randall creates one hundred new canvasses a year. She does fifty new designs in at least two new markets annually as a goal. They are typically done on a woven canvas that is 18 or 13 stitches to the inch though other sizes can be used for bigger projects. Her passion and desire to have others involved in the art form in the Rogue Valley is what led to the upcoming get-together. “We’d love to have more people enjoying the art form.” In the meantime, Randall encourages people to visit her website whimsyandgrace.com to see all her designs. From dog collars to belts to coin purses to tote bags and of course—scissors’ cases—there are many types of designs for artistic and practical pleasure. “Needlepoint is not just what your grandmother did.” It’s more than pillows and wool thread, and we stitch with silk, soy, metallic—a plethora of threads and use literally hundreds of fancy stitches for texture and embellishment.” In fact, Randall says, “There is a trend of high-powered women executives powering down with needlepoint at the end of the day.” Taking life one stitch at a time.